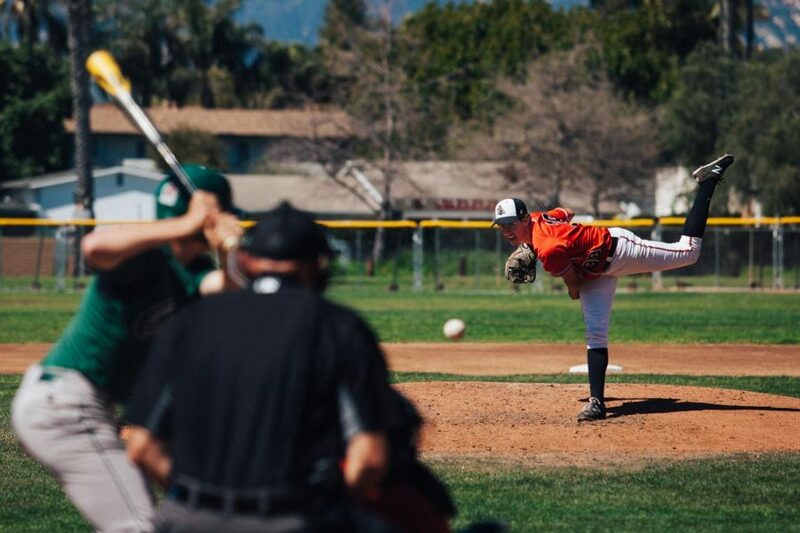 Ian Churchill pitches the ball during a game against Cuesta on Saturday, March 15, 2019, at Pershing Park in Santa Barbara, Calif. 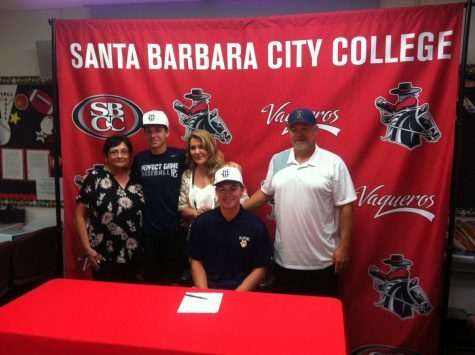 The Vaqueros went on to beat Cuesta 3-2. 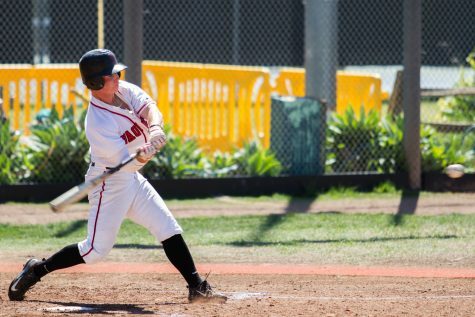 The City College baseball team defeated Cuesta College 3-2 Saturday afternoon at Pershing Park on a walkoff single by designated hitter Phil Quartararo. They were aided by a strong pitching effort from starter Ian Churchill, who pitched seven innings without allowing a single earned run. 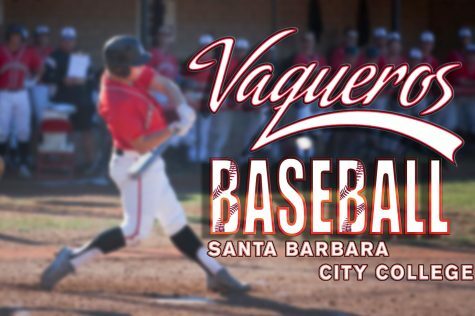 The Vaqueros struck first, scoring one run off of a triple by third baseman Mason Metcalfe in the second inning, but more offense did not come until much later in the game. Cuesta retaliated with two runs on infield errors in the fifth inning, leaving the Vaqueros trailing 2-1. 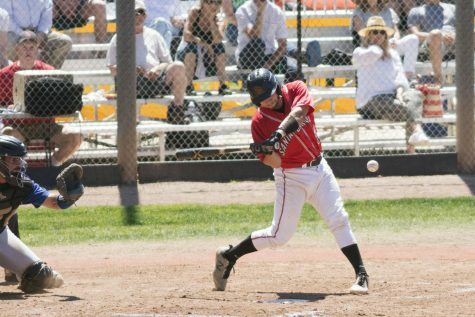 Right fielder Nicholas Trifiletti helped spark a comeback, batting in a run in the bottom of the eighth inning to tie the game. 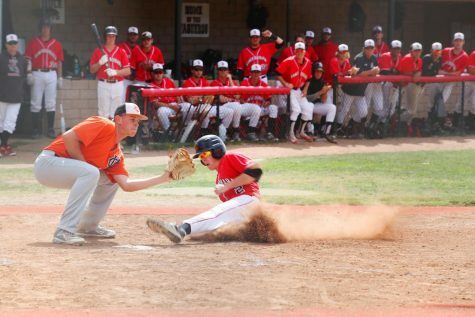 In the ninth, some timely plays by Quartararo and catcher Benjamin Martz helped seal the game for the Vaqueros. Facing a three-ball two-strike count with one out, Martz rifled a double down the left field line to get into scoring position. It was his fifth time getting on base in as many plate appearances. On the next at bat, Quartararo dropped a single into shallow center field which allowed Martz to round the bases and score the game winning run. The players mauled Quartararo with excitement, drawing cheers from the crowd. Head coach Jeff Walker said that both Quartararo and Martz stood out to him during the game, and added that he was proud of his team for rebounding after a 9-4 loss to the same team. Quartararo said after the game that his walk-off single felt especially good because he had had a “rough day” leading up to his final at bat. Before the hit he was 0/3 with a strikeout in the game. 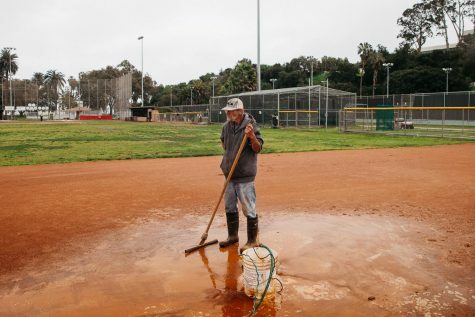 “I knew I had to give the runner a chance to get home,” he said. Ian Churchill, who started the game at pitcher, built on an excellent season with seven strong innings. He had eight strikeouts to only one walk, and all of the runs that were scored against him were considered unearned due to fielding errors. 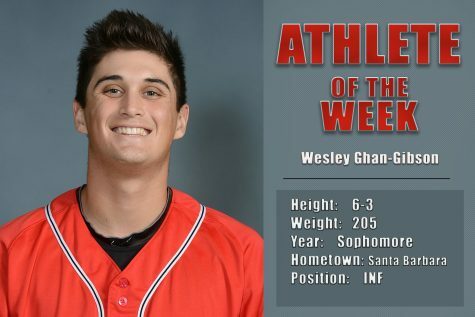 He has allowed just one earned run this season in 35 innings pitched, giving him a Western State Conference (WSC) leading 0.26 Earned Run Average. He is also second in the conference with 50 strikeouts, and is credited with four wins and no losses. 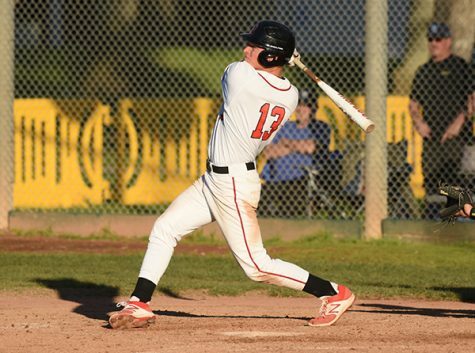 The win brings SBCC’s record to 13-7, good for first place in the WSC North Division. Quartararo said that he is excited about the way the Vaqueros are playing at this point in the season. “We are playing for each other, which is the best way to play,” he said. Their next game will take place at home against Oxnard on Tuesday, March 19. The full schedule can be found here.